The First Battle on Indian Soil. The Japanese occupation of the Andaman Islands occurred in 1942 during World War II. The only military objective on the islands was the city of Port Blair. The garrison consisted of a 300 man Sikh militia with 23 British officers, augmented in January 1942 by a Gurkha detachment of 4/12th Frontier Force Regiment of the 16th Indian Infantry Brigade. Following the fall of Rangoon on March 8, the British realize that Port Blair had become impossible to defend, and on March 10 the Gurkhas were withdrawn to the Arakan peninsula. Port Blair was occupied by Japanese on the 23rd March 1942. The garrison offered no resistance to the landings, and were disarmed and interned; many of the Sikh militia later enlisted in the Indian National Army. The British militia officers were sent to Singapore as POWs, whilst Chief Commissioner Waterfall, Deputy Commissioner Major A.G. Bird and the other British administrative officers were imprisoned. When Japanese three divisions cross Chindwin river and attack Imphal and Kohima ( operation U-Go), the first engagement in Indian soil with the Japanese tidal wave was encountered by 152 Para Battalion ,C company under Major J Fuller at Point 7378, Ukhrul, Manipur on 19th March 1944. 152 Indian Para Battalion was Under Brigadier Hope Thomson's 50th Para Brigade. The task given to 31st Japanese Division was to capture Kohima. To do this, Lieutenant –General Sato had planned to cross the Chindwin in three main columns, of which the right and centre columns were to move directly on Kohima from the north of Homalin. The left column, behind which Gen. Sato and his headquarter moved, was to cross the river at Homalin and at two places a few miles south of it, capture Ukhrul and then advance north-west on to the Imphal-Kohima Road so as to destroy the British as they withdrew from Imphal. At the same time they were to give every assistance to the other two columns in capturing Kohima. 50 Brigade had only arrived at Kohima from North-West India at the end of February 1944 in order to gain experience of jungle warfare. The Brigade , which was commanded by Brigadier M. Hope Thompson, a thirty six year old British Service Officer who had raised and trained it was made up of 152 and 153 Para battalions, a medium machine gun company, a squadron of sappers and a field ambulance. When 152 Para battalion reaches Sangshak, 153 battalion was still in Kohima. 50th Indian Parachute Brigade was formed in 1942. Its three parachute battalions were formed from volunteers from throughout the Indian Army as well as the British Army in India. The 151st parachute Battalion was formed from British volunteers, the 152nd Battalion was formed from Indians and the 153rd was formed from Gurkhas . However 151st battalion soon found itself shipped off to the 1st Airborne Division in the Mediterranean and got itself renamed 156th battalion. To replace the 151st battalion , now in middle east, came another Gurkha Unit: the 3rd Battalion of the 7th regiment, Gurkha Rifles. A wartime formation, it had taken part in the retreat from Burma in 1942 as part of the 17th Division in Slim's Burma corps, where it had suffered serious casualties, not least from sickness. Recuperating at Amritsar with a solid nucleus of battle-hardened officers and men, the battalion had volunteered en bloc to join the 50th Parachute Brigade. They had arrived at Campbellpore early in 1943, to be renamed the 154th Battalion . At the time of their arrival they numbered only about 300, which meant a great deal of recruitment still lay ahead of them. Their CO, John Stevens, who had raised and commanded them in Burma, was found unfit for parachuting; his replacement broke a leg while jumping, and it was not until Lieutenant-Colonel G.O(Joe) White assumed command some months later that the battalion really got into its stride. In mid March 1944, the 50th Para Brigade under Brigadier M. Hope Thompson arrived at Ukhrul to relieve the 49th Indian Brigade. The newly arrived Paras take over range of scattered hilltop positions once occupied by the 49th Brigade. Lt Col Paul Hopkinson's 152 (Indian) Para Battalion moved up to the position called Kidney Camp. From Kidney Camp, on 18th March he send two companies out to occupy hill top positions and relieve 4/5 Mahratta Light Infantry. 4/5 Mahratta Light Infantry went as reserved at Kidney Camp. Major Webb's B Company was dispatched to Point 7386 ( Badger) and Point 7000 ( Gamnom). While Major J Fuller's A company was sent to the militarily un-named Point 7378. All these positions dominated the two east west jeep tracks over the hills in the area. The first two days were spend improving their trenches, dugouts and firing positions. Lieutenant Susumu Nishida, the intelligence officer of the 58th regiment had made the first reconnaissance of the jungle path in 1943 with a small patrol. His meticulous work made possible the subsequent swift advance of Sato's 31st Division towards Kohima. In March 1944, the Japanese army were waiting for several days at their staging point about four kilometers from the Chindwin. At 21.15 of 15th March( X Day) an orderly rushed in with instructions to get ready to move. All along the river bank, through the regiments of General Sato's 31st Division, there was a stirring of men and animals. Lieutenant General Renya Mutaguchi had told them that the operation might even lead to the conclusion of the war, "this operation will engage the attention of the whole world and is eagerly awaited by a hundred million of our countrymen. Its success will have a profound effect on the course of the war, and may even lead to its conclusion. We must therefore expend every ounce of energy and talent to achieve our purpose". From their staging point an arc around the town of Homalin, the soldiers of General Sato's three infantry regiments, his mountain artillery and support units were converging on their designating crossing points. There were three Japanese columns advancing on Kohima via different routes. General Sato sends Miyazaki off with the main infantry group in the direction of the village of Ukhrul, where he would capture stores and then move to block the road at Kohima. Another battalion of 58th Regiment was sent through the wilds of the Somra tract to the north, while General Sato's own column would travel the central route via Kharasom. On the afternoon of 18th March, Naga villagers came into Sangshak from the Village of Pushing, about a dozen or more miles east. The Japanese had occupied their village and were moving west. On 19th March morning, Lt Col Hopkinson, personally climb up Badger to spot long column of men, a full battalion, complete with pack horses and even elephants, advancing up the Homalin road. Point 7378 lay directly in their path and Hopkinson immediately radioed a warning to Major Fuller, whose C Company was clearly going to fight the 50 Brigades first battle. The Japanese battalion that had been spotted was the 3rd Battalion of the 58th regiment. Point 7378, which stands at 7378 feet above sea level is locally called Harbakhangai. Harbakhangai is a pimple on the spur of Shiroi hill (point 8425). Harbakhangai is covered with grass and hardly any big tree grows on its peak. Point 7378 lie 2 Km east of Kangkhui Village. The Battle hill is 11.5 km as the crow flies in the north east direction from Sangshak village. The Ukhrul -Pushing jeep track passes at its southern and eastern portion. Its significance lay in the fact that it overlooked the Jeep Track between the village of Pushing and Ukhrul, at a point where it joined the slightly wider but still winding rollercoaster track north to Kohima and south to Imphal. When Major Fuller's Company reach the hill, it was half dug for defence by the Marathas. It blocked Miyazaki's advance and therefore had to be captured. From Homalin the Japanese column of 31st division passes through the village of Pushing and they have to attack Kohima after crossing Ukhrul. Point 7378 lie in between Pushing and Ukhrul. 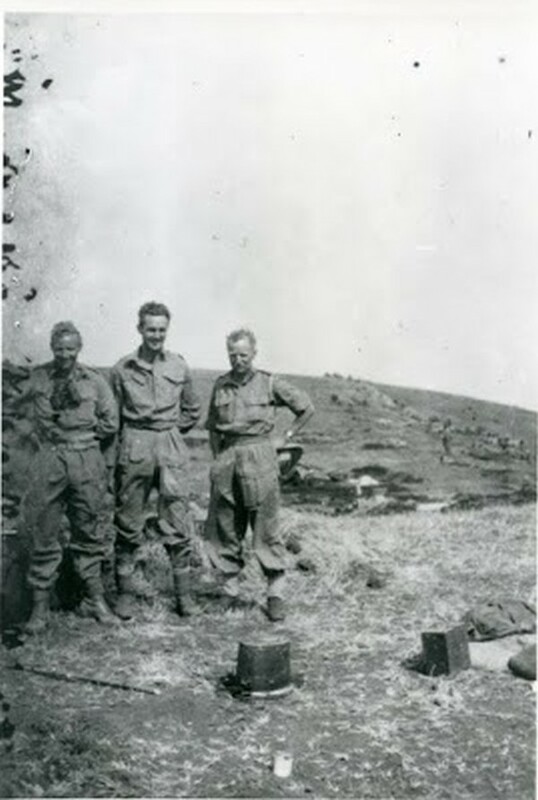 Major John Fuller's small company at point 7378 consist of a section of three-inch mortars from the support company and a pair of medium machine guns from the Brigade's machine gun company but no artillery was far enough forward to give them support; in total they numbered about 170, including seven British Ofiicers. Major Fullers order had been to hold the hill until relieved to be on his guard against small Japanese petrols that might percolate from Burma and meanwhile to continue improvement of the defences. As a matter of prudence Fuller had positioned a three man observation post about a mile ahead of Point 7378, on the track to Pushing. At 9 O clocks in the morning of 19th March 1944, Major Fuller heard from his observation team that the enemy had been sighted. Within half an hour 900 Japanese had been counted, moving fast along the track towards Point 7378. By 1400 hour the company was completely surrounded, but beat off frequent attacks which continued all day and throughout the night. Suddenly, during the following morning, the Japanese attackers noticed the defenders fire had ceased- they had run out of ammunition. Lieutenant Hirayama on the night of 19th was given order to mount flanking movement to the left of the British trenches. Once in position he settled down and waited for further order. Lt Hirayama and the rest of the 3rd battalion, 58th regiment had bumped up against Major Fuller's C Company. The first Japanese assault was beaten off. But throughout the night there were two subsequent attacks which gained ground. There were about 170 defenders. On the evening of the 19th, soon after Point 7378 came under attack, Hopkinson dispatch the 152nd's A Company under Richard Gillett , on a flanking route intended to bring them on to Point 7378 from the east. Due to the Jungle and difficulty of moving and identifying location at night they eventually reach a point about half a mile east of point 7378 and the battle was at that time at its last stage. On the other hand Trim had sent Holland and the Maratha's A company along the track from Sheldons corner, directly towards Point 7378, only to find that the Japanese had anticipated the move. They had placed a roadblock at the point where the track debounched onto the pushing- Ukhrul road. Holland was forced to call off the counter attack with six men killed and eighteen wounded. At the dawn of 20th Hopkinson heard for the last time from point 7378 from Lieutenant Easton. Major Fuller with three other officers and forty men were killed. Roseby the second –in –command had been seriously wounded and the shortage of ammunition was desperate. Lt. Easton also reported that he was gradually being overrun and was withdrawing on Sheldon's corner. Only twenty men got away to rejoin some weeks later. C company was completely eliminated, but the Japanese suffered 160 casualties including seven officers. By midday on 20 March the engagement was over, a tragic sacrifice of a fine fighting unit because of incompetence in providing supplies, barbed wire, ammunitions and above all, up-to-date Intelligence. The official history of the Japanese 58th regiment described the closing stage of the fight. A party of about twenty British and Indians charged downhill, firing and shouting as they came. But between them and the Japanese was a wide ravine, into which some of the men fell. Most of the others were forced to surrender, while a few escaped. The Japanese then witness an extraordinary scene. 'At the very top of the position an officer appeared in sight, put a pistol to his head and shoot himself in full view of everyone below. Our men fell silent, deeply impressed by such a brave act'. The suicide of an officer in full view of the enemy was not part of any British military tradition. But it was a gesture the Japanese understood perfectly and it gave them food for thought. These were different soldiers from the ones routed in Burma and Singapore. The Japanese 58th regiment suffered 160 casualties in the twenty six hour battle, during which the Para had resisted with courage and skill. A dozen soldiers of the C Company were captured as POW by the Japanese 58th regiment. Another 20 soldiers survived from the battle. The rest 140 of the C Company were killed in this battle. The bodies of following 38 soldiers of the 152 Para Battalion, C Company were not recovered from the battlefield after the war. They have been enlisted as KIA in the battle at point 7378. Following soldiers of the 4th Battalion, 5th Maratha Light Infantry were also killed around the Jeep track at Point 7378 when Marathas' A company went to help Major Fullers C company during the battle and their bodies were never recovered. Following British Officers were killed during the Battle of point 7378. Next day after the battle i.e on 21st the Japanese buried the death soldiers of C Company at the side of the track. 50 Brigade were not geared for action. They had for example, brought the Mess silver but had no steel helmets. They quickly established themselves in the Sangshak area , but although 152nd battalion had drawn stores and ammunitions at Litan as they moved up to Sangshak, the brigade received no further supplies or ammunitions- and above all no further information from Corps or Divisional HQ about the Japanese advance. No operational orders at all were received until the Japanese had put in their first attack. The inertia and competence at Corps HQ in its dealing with 50 Brigade has caused deep resentment among the survivors of this hard fought battle, with even the war diaries of Corps HQ 16-20 march showing chaos and confusion, and confirming that no directions of orders were sent to 50 Brigade. This situation seems even more extraordinary as the Brigade had a land line to 23rd Division HQ at Litan, and even after Sangshak had been cut off an effective radio link was maintained. Thus the valuable information about Japanese movements, which the V force agents had risked their lives to obtain, because of failure in Corps or Division HQ, never reached the very unit which was about to be attacked. For all the clarity of thought and speed of action displayed in the opening day of Sangshak battle, decisions that were to enable most of 50 Brigade to concentrate and fight in the vortex of Sangshak, they would have come to nothing without the valour and self-sacrifice of the doomed company at Point 7378. If it hadn't been for the valour of 50 Pare Bde delaying the advancing Japanese sufficiently long enough then IV Corps wouldn't have had time to adjust their defences around Imphal. Disclaimer :- The data and figures are not exclusive in itself. It manifest the writers research at the point of writing this article. This article was posted on October 13, 2014.